Dave Levinsohn has been doing comedy since 1997. Known as one of the Kings of Improv Comedy. Dave Levinsohn’s one of the most original acts on the circuit. 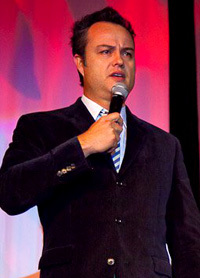 A popular choice as comedian and MC at company functions, corporate days, golf days and comedy clubs. Dave Levinsohn performed at the Vodacom International Comedy festival, The Cape Town International and the Smirnoff Comedy Festivals. One of the first SA Stand ups to be invited to perform at The Edinburgh Fringe Festival in 2012 with Loyiso Gola. He’s graced the small screen in many commercials that have gone on to win awards, and have become viral successes. He co-presented the first series of SABC 3’s ‘Going Nowhere Slowly’. Dave Levinsohn`s material darts into more lateral territory, with his “slightly-weird-guy-next-door” approach to every subject under the sun; he’s odd, without being offensive. His anarchic re-examination of everyday topics has won him fans at every appearance, as does his ability to improvise when interacting with the crowd. His on-the-spot skills often make it look as if he’s making it up as he goes… This versatile comic offers offbeat fun for anyone in the mood for a left-field comedy experience. You will most certainly want to see Dave again. Dave Levinsohn has known his true vocation since his schooldays in Springs, where he spent ten years as class clown. This versatile comic offers off-beat fun for anyone in the mood for a left-field comedy experience. As an MC at an event he strikes the perfect balance in corporate environment. You will most certainly want to book Dave again and again, to return some of the stuff he’s stolen. Wanting to Book Corporate Entertainment - We have South Africa`s BEST Artists. Hire a Comedian, Master of Ceremonies, Live Bands, Dance Acts, Hire a Magician - We have the very BEST in Live Entertainment for your function or event.